Weta, fastest boat on the water! Quote Reply Topic: Weta, fastest boat on the water! I keep seeing videos and reading posts about how fast the Weta trimaran is! They didn't like the handicap worked out by SCHRS but like to sail their PY of 950. That is 3% slower than a Sprint 15 and 10% slower than the old Dart 16. Is that fast for a boat with 3 sails and made of carbon fiber? Perhaps their should have used plastic! I think it's relative... most Weta sailors come from monohull, displacement sailing backgrounds. A Weta that makes it around the course is faster than a capsized Musto Skiff, a Moth that trips up on every gybe and a hell of a lot faster than any Laser or Solo- even one sailed by the best dinghy sailors in the country. The fact that it is not a Cat, and by and large, has been rejected by the monohull community is a marketing issue for them, not a speed one. I saw one in the boat park at Weymouth - it looked quite small compared to the cats nearby, so I'm not surprised it is slower. Are you trying to say that many single hulled dinghies would find it attractive on the land and would like to make love to it? Is it a marketing issue? Its heavy (100kg by the look of the web site), its relatively complex to rig and sail (3 sails), its not as manoeuvrable as a dinghy on or off the water, it looks pretty tricky to right after a capsize, and its not particularly fast (PY 950 is similar to a Vortex). Given the carbon etc, its probably not that cheap either. 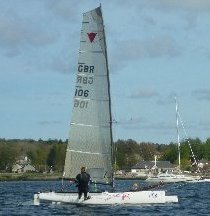 In the UK is a Laser/Musto Skiff/RS 700/RS600/Solo/RS100/D-1/Streaker sailor really going to get one? 39 years of dinghy racing and still waiting to peak. however in emerging markets, without the baggage of our complexity, they can sell it as fast and accessible... which it is I guess. But what it does offer is a FAST boat that is stable, can be sailed and raced without worry of the wind strength or physical infirmity. That you can also cruise without safety cover or do distance touring that is also a great holiday boat for sailing with a young or even not so young family. Or even fished from. It's actually rather a gem of a boat, but I doubt the small minded dinghy sailor in the UK will understand these virtues. As we don't have a culture of enjoying the natural world unless we are competing against someone for a tatty plastic cup, unlike the majority of the rest of the world. despite chasing crap plastic cups in my stealth and god forbid to admit snotter , i spend many more hours cruising the west coast of scotland in my AWB , so I guess I can understand the attrubutesyou attest to . however reading behind the lines , its weta and weta sailorsmarketing itself as the fastest thing on three legs that folks are pulling its leg about . as if no other dinghy had ever gone sooo fast .